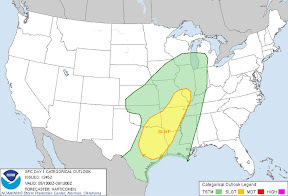 The Storm Prediction Center has placed all of southeast Missouri and portions of southern Illinois, western Kentucky and Arkansas in a "Slight Risk" area for severe thunderstorms in their latest outlook. It appears the best chance for severe storms in southeast Missouri and southern Illinois would be later tonight. There are still a few question mark for severe thunderstorms to develop. We need to see the atmosphere destabilize. Right now the air mass in place is relatively stable. As the surface low currently over Texas/Oklahoma tracks northeast the low will deepen (become stronger). Ahead of the low, southerly winds should tap in to more humid air to the south. Forecast models are indicating instability should move back north and allow the atmosphere to become unstable by tonight. If the air mass can become unstable there will likely see a few thunderstorms moving east across Arkansas and Missouri. The main threat appears to be damaging wind. I can't rule out the chance of a quick spin up tornado, especially close to the track of the surface low. The good news is that if there is a tornado it won't be like the long lived tornadoes seen in Oklahoma yesterday. A couple things bother me about the setup... Cloud cover. Missouri is pretty well socked in with cloud cover. This is going to limit instability somewhat. Timing... The storms would likely move in well after sunset. This will take away some of the spark in the atmosphere. That's not to say we couldn't see something after dark, I just think that storms will be on the downward trend of severity. Will there be thunderstorms? Probably. Will there be a watch? Possibly. Will there be a severe weather outbreak? No. Could there be warnings? Yes, there could be a few. Should you freak out? No. Just keep an eye on the situation. Make sure you have your NOAA weather radio plugged in. Have a way to be alerted if a warning is issued for your location. Appreciate how you break things down for a chicken like myself. Glad I can depend on you and your forecasts. Thanks! !